1958 built for James Fisher & Sons Ltd., Barrow. Chartered to Atlantic Steam Navigation Co. Ltd..
1967 taken on long term charter by Northern Steam Ship Company. 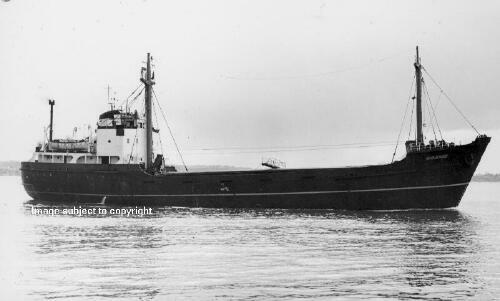 1970 March bought by Northern Steam Ship Company and renamed MOANUI. 1975 sold to Crossworld Management & Brokerage (H.K.) Limited of Singapore. Renamed CHANTALA FORTUNE. 1977 sold to Pacific International Line (Singapore) and renamed KOTA PAHLAWAN. 1986 had been lying in Madras Roads under arrest for some time. 1987 May 2nd left Madras under tow FENG NAN bound for Singapore. 1987 May 11th vessel began drifting, tow rope snapped, and she ran aground near Gravet Point, Sri Lanka, becoming a total loss (NZMN Vol.37 No.2).